This winter TNT is bringing you the TNT Mystery Movie Night. All winter, you can catch your favorite stars in crime-novel adaptations of books by authors like Scott Turow, Mary Higgins Clark, Sandra Brown and more. 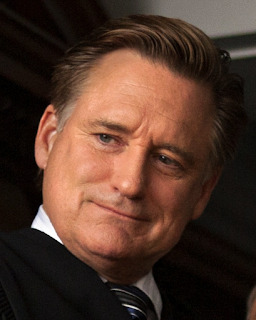 Bill Pullman, who is known for such fare as "Spaceballs," "While You Were Sleeping," "Lost Highway," "Independence Day" and "Torchwood: Miracle Day," is headlining the series by starring in “Scott Turow’s Innocent,” which is the sequel to “Presumed Innocent,” picking up in the lives of Rusty and Barbara Sabich two decades after "Presumed Innocent" ends. Since the movie has been out for more than 20 years, I don't think a spoiler alert is needed to say that at the end of that movie, we learn that Barbara is the one who killed Rusty's mistress, Carolyn. “Scott Turow’s Innocent” opens with Rusty being accused of murdering Barbara, mirroring the accusation he was cleared of years before with Carolyn. I spoke with Bill recently about the movie, which premieres tonight on TNT at 9 ET/PT. Celebrity Extra: How did you prepare for your role of Judge Rusty Sabich? Did you rewatch "Presumed Innocent," or did you want to go into it with a clear slate to develop the character your own way? Bill Pullman: I was in the middle of other things and got sent the script, and I read it. I hadn’t seen "Presumed Innocent” all those years ago, and so I thought it was a remake of "Presumed Innocent." I knew it had been a successful movie with great actors and writing and all that. I didn’t want to do a remake of it and waste time and waste money. But I just kept thinking about the script and everything, and I thought, “This is a pretty good script; it’s too bad it's a remake.” But then I looked on IMDb about "Presumed Innocent," and then I realized that this is a whole other story. So I signed on without having seen "Presumed Innocent," but it was great to watch it when I did see it. CE: Twenty years have passed, and we really have to wonder how Rusty continued on in his marriage to Barbara, who's a manic-depressive and who killed his mistress. How does he make it through each day? BP: I think that the idea of what it would take to mask over that and to make a choice about how guarded you are as a person. I think if you lived inside of that for that long, you learn the secrets of how to keep a secret, which is a lot of compartmentalization partly. It’s sad, but the fact is a lot of marriages are held together with a lot of things that make for a compromised marriage, which you do for various reasons. It’s an interesting moment to catch a character whose been so successful out there for 22 years and finds himself swept in an undertow, back into another jeopardizing circumstance, and then just trying to be again incredibly controlled with how he responds to it. He holds it together with this façade that’s come in to be ingrained in him from then on. CE: Knowing what Barbara was and seeing what she's become, you can understand why Rusty finds himself in the arms of another woman again, this time with Anna Vostic (played by "True Blood"'s Mariana Klaveno). BP: Good, I’m glad that you feel that way, because it's definitely difficult. There’s the age difference, there’s so many things that would make that them the least likely match, but I think it has a lot to do with Anna. She has a certain truthfulness about emotions. She has an emotional intelligence that’s ahead of him, she really does. He does understand the nature of emotion when she says that she loves him. CE: What are some aspects of Rusty's character that you could relate to or empathize with? BP: Being a judge with the court of appeals, there’s quite a bit of needing to uphold the law and needing to be careful to never make a mistake. He has an understanding of human behavior and a sense of humanity. I think that scene where he tips off that character in the beginning about the outcome of his case is a result of his humanity, and not because he’s a terribly flawed in a judicial sense. He is dealing with judgments about people constantly, and he’s still alive to the fact that human behavior is complicated. I like that part of him. And I think there is a way where he has been very connected emotionally to his wife. As much as he can be erratic, there are times where he loves her very much, like that scene where she’s on the bed with the negligee on, that could have gone another way. CE: What was life like on the set? BP: There was a good simpatico feeling. Everybody was generous — I think they proved it with the real test of those of us in those courtroom scenes. Those take days and days to shoot because every angle has to be covered, and there’s a lot of technical details that have to be dealt with, doing them a thousand times from a thousand different angles. Those are long days, and I we kept it very fun all the way through. We all had a great rapport, and we’ve all been keeping in touch through e-mail, which is kind of a rare thing. I think it’s a sign that we all really felt like we had done a play together or we had done something where we really lived in the zone. I enjoyed everybody’s company. CE: What were your thoughts when you heard this was going to be on TNT, and not released as a feature film like its predecessor? BP: I'm not a big television watcher, but I love the artistic opportunities it presents. I like the image of people on their sofas on a winter night just getting down with a good, compelling thriller. Makes me want to watch more television. CE: You've had the opportunity to star in a lot of great television lately, most recently "Torchwood: Miracle Day." BP: Yeah, I know. I’ve had some great experiences working on "Torchwood." It was a really unusual character. Yeah, definitely giving me permission to go into a zone on that one. Kind of shut me down. I thought that the whole allegory of a miracle day and the fact that nobody is dying anymore was so interesting, to think about the way our lives are with modern medicine and the perpetuation of life no matter what the quality is. It was a good ride. But something like "Scott Turow's Innocent" — I know that features are hugely expensive, especially studio things. Sometimes stories don’t need all that much money. If you’ve got a good cast and a good script and somebody who can direct the thing, you can pull it together. It’s been good for television. You’re watching good stuff all the time on your sofa with your glass of wine. CE: Lately you've been doing a lot of dramas, which I love, but do you ever think about going back to doing some goofy or dark comedies, like "Spaceballs" and "Mr. Wrong"? BP: Oh yeah, yeah. I’m so glad you mentioned "Mr. Wrong," because I think that movie got a little buried. CE: So, if you got the right script, you'd be game? BP: I’d be game. Sign me up. Spread the word. I love Bill Pullman. He was terrific in Lake Placid and Sleepless in Seattle. I would have chosen his character over Tom Hanks' any day. Today, I'm watching Sibling Rivalry, and he's terrific in that, too. Go, Bill!